In the next installment of my recipe series, here is my apple ale recipe, which I am calling New England Apple Ale. I wanted to make a full-bodied beer, that made you think of apples (and cider, and apple pie). I wanted this to hold its own as a beer first, rather than a beer-cider hybrid, or a sickly-sweet fruity beer. I think I pulled this off. The apple notes are strong, but they are balanced by the toasty notes from the roasted barley. The cinnamon and nutmeg in this recipe are dialed down from the last iteration of this beer I brewed, and I think that helps a lot. 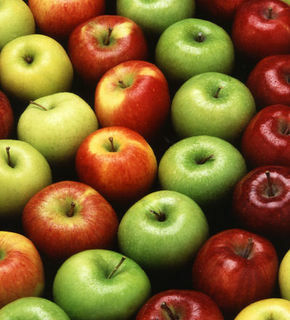 It still reminds you of apple pie, without completely being one. This recipe took 3rd place in the 2008 Sam Adams Tour Center homebrew contest. Read on for the full all-grain recipe. In the first of (what I hope to be) many postings of my homebrew recipes, here is one of my favorites. 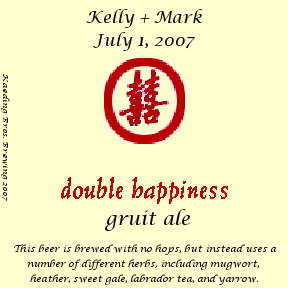 It is my take on a traditional gruit-style ale. I am starting with this recipe partly because it turned out very well, even winning 3rd place in the 2007 Greater Huntington Homebrewers Association Mountain Brewers Open. Also, I imagine that a lot of people will be wanting to explore the gruit style, since it doesn't use any hops (or, at least, my recipe doesn't use any hops), and with the hops shortage, I know a lot of brewers are looking for alternatives. I know what you might be thinking: "What self-respecting beer geek wants a beer with no hops?" Well, if that's what you are thinking, then you really need to open your mind, and try this beer. I can't stand the more-hops-is-always-better attitude, but thats a rant for another day. Lets get back on track.